Valentine's Day is a wonderful opportunity to share your love with all the people you truly care about. With the special day just around the corner, Royalty Bangladesh curated the perfect Valentine's week offer "Buy 1 Platinum Card & Get A Complimentary One for Your Loved One." Royalty Bangladesh is a privilege platform offering discounts in 6 different categories. We are not just a discount platform, we are your lifestyle partner! What benefits you get being a Royalty Cardholder find out more here and check out all our exclusive partners by clicking here! Follow the regular process to order your first platinum card. Details on how to order can be found here. 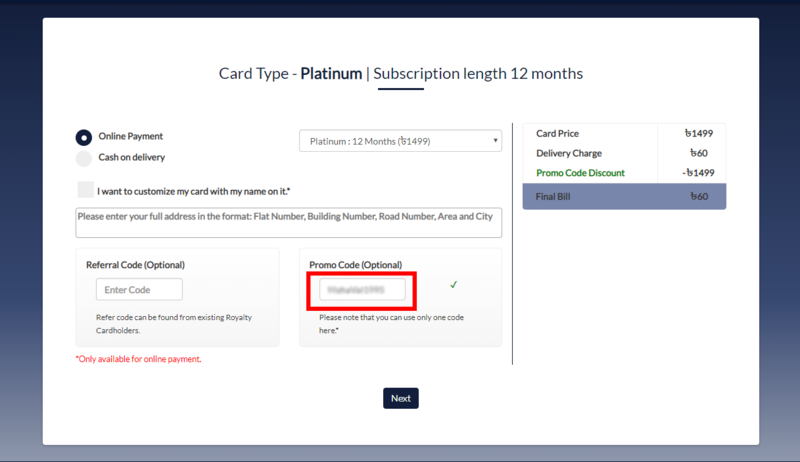 Once you have successfully ordered your first card, a Promo code will be sent via e-mail to you within 24 hours. Follow the same procedure to register for the second platinum card, apply the promo code in the payment page to get the offer. *The promo code can be applied only once and is valid until 15/02/19 11:59 pm. *The Delivery charge and customization charge (if applicable) will be applied on both the cards. *Delivery time for Valentine's Week order is 5–7 working days. In case of customization, only the first two names will be used. If you want to change that, please email us within 24 hours at support@royaltybd.com or you can call our customer service at +880–963–862–0202. Make this Valentines a memorable one and share your love with Royalty BD. Royalty Bangladesh offers you the best deals in town. Royalty Cardholders can enjoy up to 50% discount in our partner outlets. Refer your friends & family to earn cash bonuses which you can redeem in our partner outlets! You need to have a Royalty user account to be able to follow. By default, your browser might block pop-ups from automatically showing up on your screen. When a pop-up is blocked, the address bar will be marked Pop-up blocked. You have to allow pop-ups to access the control panel. Please verify your email address associated to this account. You can edit if this isn't your correct email. You need to be a Royalty Member to be able to like reviews. Sign up/Login to like this review. You have successfully redeemed a cash coupon worth ৳250 for . This coupon will expire in 7 days. Browsing from phone? Download our app!